I just installed Ubuntu 11.04 over an older version of Ubuntu, and am dual-booting with Windows 7. Most things seem to be working well (i.e. wifi, sound, etc.) but boot time is problematically long. After choosing 11.04 from grub 1.99, I get the purple screen for several minutes before the Ubuntu log-in finally appears. [  305.843685] type=1400 audit(1305950932.592:2): apparmor="STATUS" operation="profile_load" name="/sbin/dhclient" pid=449 comm="apparmor_parser"
[  305.849067] type=1400 audit(1305950932.600:3): apparmor="STATUS" operation="profile_load" name="/usr/lib/NetworkManager/nm-dhcp-client.action" pid=449 comm="apparmor_parser"
[  305.856958] type=1400 audit(1305950932.608:4): apparmor="STATUS" operation="profile_load" name="/usr/lib/connman/scripts/dhclient-script" pid=449 comm="apparmor_parser"
Any help would be appreciated as I am rather new at this and would really like to move to linux. Thanks, and sorry in advance if the answer is really obvious!! [  164.711774] [drm] Supports vblank timestamp caching Rev 1 (10.10.2010). [  164.711781] [drm] Driver supports precise vblank timestamp query. [  165.325992] type=1400 audit(1306246511.880:2): apparmor="STATUS" operation="profile_load" name="/sbin/dhclient" pid=453 comm="apparmor_parser"
[  165.327099] type=1400 audit(1306246511.880:3): apparmor="STATUS" operation="profile_load" name="/usr/lib/NetworkManager/nm-dhcp-client.action" pid=453 comm="apparmor_parser"
[  165.327828] type=1400 audit(1306246511.880:4): apparmor="STATUS" operation="profile_load" name="/usr/lib/connman/scripts/dhclient-script" pid=453 comm="apparmor_parser"
[  165.329429] type=1400 audit(1306246511.884:5): apparmor="STATUS" operation="profile_replace" name="/sbin/dhclient" pid=490 comm="apparmor_parser"
[  165.330528] type=1400 audit(1306246511.884:6): apparmor="STATUS" operation="profile_replace" name="/usr/lib/NetworkManager/nm-dhcp-client.action" pid=490 comm="apparmor_parser"
[  165.331261] type=1400 audit(1306246511.884:7): apparmor="STATUS" operation="profile_replace" name="/usr/lib/connman/scripts/dhclient-script" pid=490 comm="apparmor_parser"
[  165.600141] fixme: max PWM is zero. [  168.340294] hda_codec: ALC272: BIOS auto-probing. [  170.962880] type=1400 audit(1306246517.516:8): apparmor="STATUS" operation="profile_replace" name="/sbin/dhclient" pid=727 comm="apparmor_parser"
[  170.963690] type=1400 audit(1306246517.516:9): apparmor="STATUS" operation="profile_replace" name="/usr/lib/NetworkManager/nm-dhcp-client.action" pid=727 comm="apparmor_parser"
[  170.964540] type=1400 audit(1306246517.520:10): apparmor="STATUS" operation="profile_replace" name="/usr/lib/connman/scripts/dhclient-script" pid=727 comm="apparmor_parser"
[  171.008505] type=1400 audit(1306246517.564:11): apparmor="STATUS" operation="profile_load" name="/usr/share/gdm/guest-session/Xsession" pid=726 comm="apparmor_parser"
[  171.198493] type=1400 audit(1306246517.752:12): apparmor="STATUS" operation="profile_load" name="/usr/lib/cups/backend/cups-pdf" pid=734 comm="apparmor_parser"
[  171.199837] type=1400 audit(1306246517.752:13): apparmor="STATUS" operation="profile_load" name="/usr/sbin/cupsd" pid=734 comm="apparmor_parser"
[  171.262460] type=1400 audit(1306246517.816:14): apparmor="STATUS" operation="profile_load" name="/usr/sbin/tcpdump" pid=744 comm="apparmor_parser"
[  171.306533] type=1400 audit(1306246517.860:15): apparmor="STATUS" operation="profile_load" name="/usr/bin/evince" pid=728 comm="apparmor_parser"
[  171.316601] type=1400 audit(1306246517.872:16): apparmor="STATUS" operation="profile_load" name="/usr/bin/evince-previewer" pid=728 comm="apparmor_parser"
[  171.323405] type=1400 audit(1306246517.876:17): apparmor="STATUS" operation="profile_load" name="/usr/bin/evince-thumbnailer" pid=728 comm="apparmor_parser"
[  389.899832] type=1400 audit(1306247595.366:2): apparmor="STATUS" operation="profile_load" name="/sbin/dhclient" pid=415 comm="apparmor_parser"
[  389.922486] type=1400 audit(1306247595.390:3): apparmor="STATUS" operation="profile_load" name="/usr/lib/NetworkManager/nm-dhcp-client.action" pid=415 comm="apparmor_parser"
[  389.924183] type=1400 audit(1306247595.394:4): apparmor="STATUS" operation="profile_load" name="/usr/lib/connman/scripts/dhclient-script" pid=415 comm="apparmor_parser"
[  393.252233] type=1400 audit(1306247598.721:5): apparmor="STATUS" operation="profile_load" name="/usr/share/gdm/guest-session/Xsession" pid=610 comm="apparmor_parser"
[  393.262138] type=1400 audit(1306247598.729:6): apparmor="STATUS" operation="profile_replace" name="/sbin/dhclient" pid=611 comm="apparmor_parser"
[  393.272282] type=1400 audit(1306247598.741:7): apparmor="STATUS" operation="profile_replace" name="/usr/lib/NetworkManager/nm-dhcp-client.action" pid=611 comm="apparmor_parser"
[  393.273883] type=1400 audit(1306247598.741:8): apparmor="STATUS" operation="profile_replace" name="/usr/lib/connman/scripts/dhclient-script" pid=611 comm="apparmor_parser"
[  393.389565] type=1400 audit(1306247598.857:9): apparmor="STATUS" operation="profile_load" name="/usr/lib/cups/backend/cups-pdf" pid=616 comm="apparmor_parser"
[  393.411543] type=1400 audit(1306247598.877:10): apparmor="STATUS" operation="profile_load" name="/usr/sbin/cupsd" pid=616 comm="apparmor_parser"
[  393.453436] type=1400 audit(1306247598.921:11): apparmor="STATUS" operation="profile_load" name="/usr/bin/evince" pid=613 comm="apparmor_parser"
[  395.302301] [drm] Supports vblank timestamp caching Rev 1 (10.10.2010). [  395.302308] [drm] Driver supports precise vblank timestamp query. [  396.096476] fixme: max PWM is zero. [  397.289225] hda_codec: ALC272: BIOS auto-probing. [  399.145586] type=1400 audit(1306247604.613:15): apparmor="STATUS" operation="profile_replace" name="/usr/lib/cups/backend/cups-pdf" pid=973 comm="apparmor_parser"
[  399.148806] type=1400 audit(1306247604.617:16): apparmor="STATUS" operation="profile_replace" name="/usr/sbin/cupsd" pid=973 comm="apparmor_parser"
Sadly, reinstalling ureadahead has not decreased the time. I saw some problems with the same a year or so back. Do you have a file named/var/lib/ureadahead/pack? If so, delete it with sudo rm /var/lib/ureadahead/pack and then do a reboot (this will force a rebuild of the pack file used by ureadahead). After a couple of reboots some have reported to work and some claim the problem came back. Resolving these sort of issues can be more trial and error. From the look of your trace there is a probably interrupt issue which its hanging on. So here are a few things to try. Try some one of the common boot options - "nomodeset", "noapic", "nolapic" or "acpi=off" as per this AU question and answer. Try disconnecting all devices - make sure you limit yourself to having a wired keyboard and mouse plugged in. ... and confirm that /dev/sda5 isnt cross mounted i.e. You should try 'bootchart' to see the time period. I have the same matter. 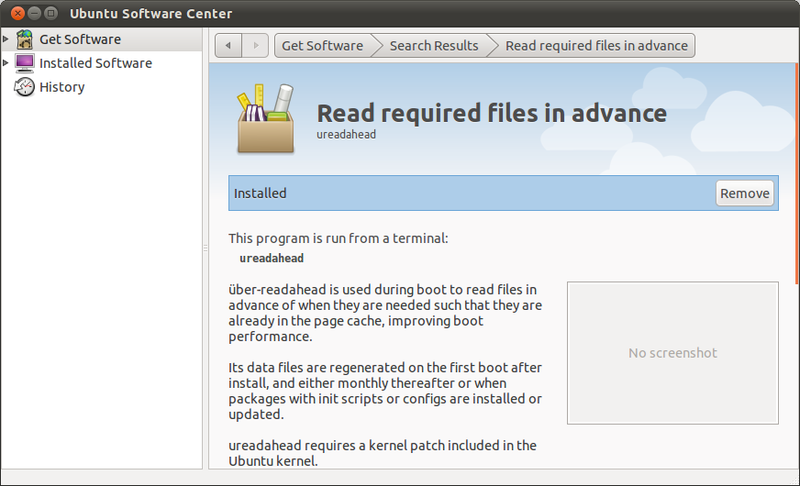 remove e4rat, and install ureadahead again. Not the answer you're looking for? Browse other questions tagged 11.04 boot filesystem or ask your own question. How do I set 'nomodeset' after I've already installed Ubuntu?